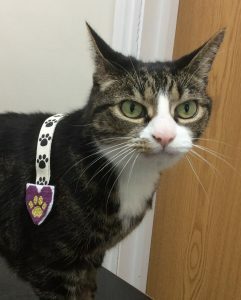 We at Portland Vets like to award one of our patients every few months, a hand made (by Kate!) embroidered heart, which is given after a team discussion. We all put forward patients we believe have had a tough time but have coped with their illness bravely, and won our hearts. This summer we made the unanimous decision to award the Purple Heart to Billy. Meet Billy our Summer Purple Heart Award winner! Billy came in to see us as an emergency one Saturday afternoon, after his owners had noticed spots of blood around the house and that he was lethargic. Fortunately, they brought him straight in to the practice to see Kate who found that he had a very large, hard and painful bladder. He was admitted into the hospital straight away as it was very likely that he had an obstruction in his urethra (the tube that urine passes through when leaving the body) meaning he couldn’t pass urine, a life-threatening condition. He was put on a drip and given strong pain relief immediately and had blood tests which showed that he had raised kidney values due to the fact that his body could not get rid of the waste products produced by the kidneys. He also had raised potassium due to the blockage. Soon after being admitted Billy was anaesthetised to unblock his urethra. A catheter was passed into his bladder and 145ml of very bloody urine was removed. An X-ray showed a stone in his bladder which had likely found its way into his urethra, causing the blockage. Billy stayed in hospital with his catheter in place, being closely monitored for 48 hours before having surgery on his bladder to remove the stone. Unfortunately, as it was so inflamed, the wound in the bladder wall did not heal properly so he had a second surgery three days later to repair a hole. Throughout his treatment and stay on the ward he was the best patient, never grumpy despite his discomfort. Always ready and waiting for fuss and a cuddle. Nearly two weeks after first coming to see us, Billy went home to his family on a special diet to reduce the risk of him having any more bladder stones. Billy’s treatment was a fantastic Portland Vets team effort combined with a family that adore him lavishing care on him whilst he recuperated at home. We are all so pleased that he made a full recovery and is back home enjoying family life. 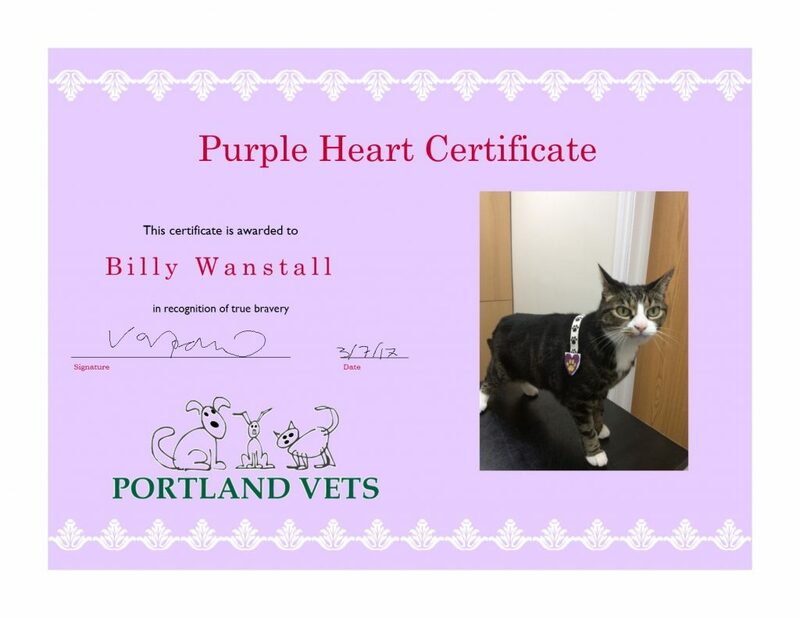 Comment on "This Summers Purple Heart Award Winner"
Only Portland vets could think of such a lovely thing to do,go Billy.